It’s a big one this this, and it’s fronted by the biggest of them all from the Land Rover stable. 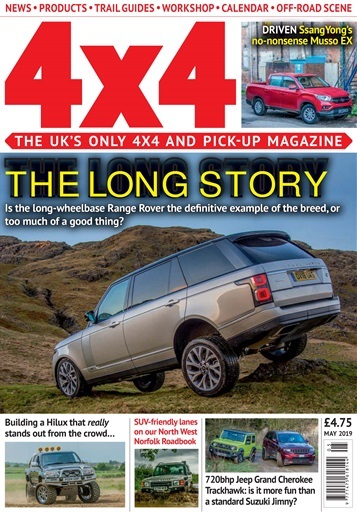 We’ve spent time in the long-wheelbase Range Rover and pondered whether it’s possible to have too much of a good thing, whilst also putting a shift in with the new entry SsangYong Musso EX to see if it’s up to the task in the pick-up market. There’s a meeting of David and Goliath as we pit the new Suzuki Jimny up against the bonkers 710bhp Jeep Grand Cherokee Trackhawk – all in the name of fun. 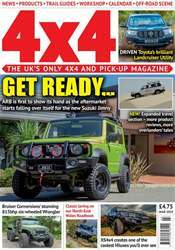 We’ve also got features on a custom Wrangler and an attention-demanding Toyota Hilux. There’s time to reflect on our long-term Skoda Kodiaq, plus we tell the story of turning up to a Land Rover festival – in Columbia of all places. Our Lane Guide this month shows you around North West Norfolk and we’ve noteworthy updates on the Ineos Projekt Grenadier – y’know, the spiritual heir to the Defender’s throne – and the opening of a new off-road site in West Sussex. 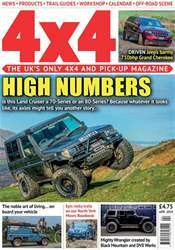 Add to that with a side order of off-road scene updates, plus plenty of new products to nibble on, and you’ve got a rather full plate until the next issue.